Do not let the title of this book scare you into not reading it. A more appropriate title would have been, "Get More Living Out of Life" or some variation of that. 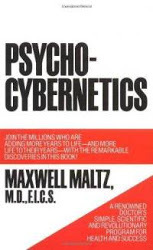 Mr. Maltz was a plastic surgeon back in the day (1920's-1960's) and found something rather fascinating when he would change or alter someones appearance - they would emotionally change as well. He felt that it was his moral duty to be well versed in psychology to better prepare his patients for the emotional change that awaited the other side of their surgery. The majority of his cases were patients who had experienced a traumatic accident or born deformity that had impacted them psychologically - taking away their enjoyment for life. For some the physical change brought about by plastic surgery was enough to bring their confidence selves back to the surface. For others though, they were convinced that the surgery had not even taken place and that their emotional scars were so deep nothing could remove their own stigma of who they perceived themselves to be. He then goes on to explain his theories of failure mechanisms, success mechanisms, happiness, self-image, and self-confidence. Considering the book was published over 52 years ago I can't help but wonder if he is the father of modern processes for life fulfillment. I found myself immersed in his very basic ideas about perception and reality, hyper-consciousness, and how we hold ourselves back. The majority of this book is echoed in the likes of Jim Rohn, Jack Canfield and Anthony Robbins among, I am sure, many others. I want to read it again. So clearly I recommend that you read it.